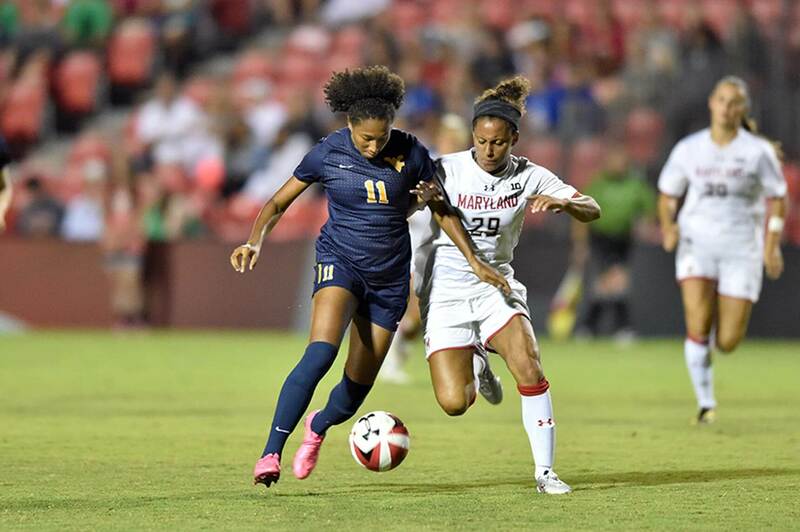 The First Round of the 2016 NCAA Division 1 Women’s Soccer Tournament took place this past weekend. In all, 64 teams from across the country made it to “The Dance” and faced off in 32 knockout ties. A total of 31 States (plus the District of Columbia) were represented in this year’s bracket, from Seattle to Florida and South Dakota to Tennessee. Several Division 1 Women’s Soccer “heavyweights” overcame the first hurdle. West Coast powerhouse, Stanford, is the current #1 team in the country, according to the Ratings Percentage Index (RPI) which calculates the most in-form teams based on the strength of their scheduled opponents. They made it through and joined fellow seeded programs such as Florida, South Carolina, West Virginia and Georgetown, all of whom progressed as expected. There was room for a couple of early underdog stories and upsets, however. Southern Illinois University Edwardsville (SIUE) saw off 3x national champions, Notre Dame. SIUE began the week ranked #174 in the nation! Elsewhere, NC State’s victory over nationally-ranked #19, Minnesota, has also sent a clear message that no-one will be guaranteed an easy path to the latter stages. Out of the remaining 32 teams all vying for the NCAA championship, no side is still unbeaten, meaning that many fixtures will come down to who wants it most and can deliver on the night! Round 2 will provide us with some fascinating encounters, including Virginia vs. Penn State (2015 National Champions), Oklahoma vs. BYU and Auburn vs UConn, to name but a few. Also in the hunt are North Carolina, who have a record 21 NCAA Women’s Soccer titles – which is 18 more than the second highest, Notre Dame. Other programs, such as UConn, Florida State, Santa Clara and UCLA have all reached the “College Cup”/”Final Four” on 7 or more occasions. All of the games will be played on the 17th or 18th November, with the Round of 16 matches (“Sweet Sixteen”) ties closely following this weekend on the 19th and 20th November for those fortunate enough to make it that far. Monday evening saw the announcement of the 2016 NCAA Division 1 Men’s Soccer Tournament. After an enthralling season, 48 teams are left in this year’s pot going into mid-November. Unlike the Women’s format, the Men’s bracket has just 32 of those teams competing in the First Round of fixtures, with an additional 16 seeded teams receiving a “bye” through to the second phase of the competition. A total of 24 States are represented this year, although all players and coaches will have their eyes on reaching the “Final Four” in Houston, Texas in early December. Before then, however, there is plenty of college soccer to be played and it begins on Thursday 17th November! College Scholarships USA are extremely excited to follow the progress of all 20 of their clients involved in the Men’s NCAA Tournament. A battle of the Division 1 titans will take place when Joel Rydstrand leads his Creighton University side out against Casper Venstad’s University of Tulsa. Elsewhere, Fordham University boys Jørgen Oland and Ola Sandneswill do their best to overcome Boston College and their Swedish goal machine, Simon Enström. Torgeir Nybø, Trygve Ellingstad and Julian Veen Uldal (South Carolina) face the second round possibility of playing their greatest rivals and #3 team in the nation, Clemson University, who are represented by Patrik Bunk Andersson and Iman Mafi. However, their side will have to first get past underdogs Mercer University. San Diego State University, represented by Emil Kjellker, will face off against University of Las Vegas Nevada with the winners progressing to take on University of Denver (one of only 2 teams who are yet to be beaten this season). Freddy Jonsson and his Colgate University teammates will leave behind the chilly winds in upstate New York and travel to sunny Los Angeles to battle it out with UCLA (the team with the most NCAA Tournament appearances – 44). Fellow upstate New Yorkers and nationally ranked #6 program, Syracuse, will await the winners of the First Round tie between Dartmouth and St. Francis University. ‘Cuse boasts a host of Scandinavian CSUSA talent, including Øyvind Alseth, Jonathan Hagman and Andreas Jenssen. Finally, in what has been an amazing year for Sivert Dæhlie, Jo Vetle Rimstad, Ulrik Koren and Jakob Stranddsäter at Radford University with the capture of the Big South Tournament title, they must now get by a tough Coastal Carolina squad in order to keep their season alive. Their reward will be a Second Round clash with the #2 ranked school in college soccer, Wake Forest. An early favourite to go all the way is the University of Maryland. The Terrapins are the number 1 team in the nation, Big 10 Champions and still unbeaten having won 16/18 contests this year so far. Out of all the teams still in the hat, Indiana University have won the most National Championships with 8 titles to their name (the most recent coming in 2012). However, defending champions Stanford University have plenty to prove and join IU as a top-10 ranked team going into this week after claiming a 3rd successive Pac-12 Conference title. As the games come thick and fast, we will be posting updates on scores, upsets and goal highlights from all over the US. Stay tuned for more coverage as the “business end of the year” begins to take shape. Best of luck to all players and coaches – in particular our competing CSUSA clients!